The SITE INDEX has been removed from the BLOG UPDATE page and is now a separate page on the site which is directly accessible from the CATEGORY list in the main HEADER or in the list on the right panel. LTS is now in WINTER OPERATION MODE which means that all the in-line heaters for the water pipes have been activated, all the water trough heaters have been installed and connected and each of the PUMP/VALVE ROOMS have heaters installed and operational. – Do not turn off the lights in the valve rooms in the Lesson Barn and Bank (Pony) Barn during the winter months. There is enough heat from a lightbulb to keep these small rooms warm for a short period of time, in the event of a heater failure. This does not apply to the Main or Private barns as those rooms are too large. -If you see a water trough that does not have enough water for the heater to be floating in the water, please advise the staff of the situation so that it can be corrected. If there is no contact between the water and the heater then the heater shuts off automatically. If there is ANY DOUBT about what to do or what you have done, do not hesitate to ask for direction or assistance. A small mistake can mean a frozen pipe, ruptured valve or a flood. It is much better to be safe than sorry – so if there is any doubt, please ask. I have moved the SITE INDEX to a separate page. I will update the index whenever a new category or page is added, but if you notice I forgot to do the update please post a comment on this page. You can also reach any of these main topic areas from the MENU BAR in the HEADER or through the LIST OF CATEGORIES on the RIGHT PANEL of the Blog. You can also sign up on the RIGHT MENU to receive e-mails for all new page postings (not updates) to the blog or you can sign up for the RSS feeds. If you have any question about any of these services, just respond with a COMMENT to this posting. Many people ask – what is the Quonset Hut? Well, in simple terms a “Quonset Hut” is the steel building at the back of the property, just south of the Main Arena. The name comes from the fact that they were first manufactured in Quonset, Iowa during the First World War as a structure to protect aircraft and house soldiers. They could be easily manufactured, moved in pieces and assemble quickly. 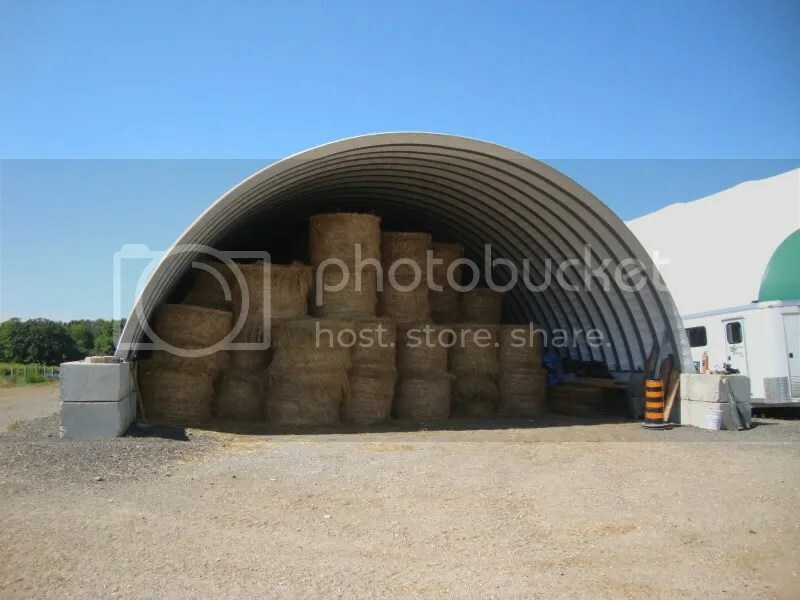 The Radisic Quonest Hut (which is not really part of the LTS operations) is primarily for the storage of the large round hay bales, to ensure protection from the elements. When the hut is not full of hay, as it is in the late summer and fall, it also provides winter protection for the farm mechanical equipment. Although no work was carried out within the Quonset Hut, the area to the rear (see pictures) had been a favourite storage area for “junk” by the previous tenants. Several weeks were spent in the fall of 2009 cleaning up the area between the Quonset Hut and the Main Arena and the area at the back. A large bin of waste metal and a separate bin of garbage were hauled away from this area. Significant amounts of scrap wood was sorted and stored on a newly constructed platform (for safety). In August 2010 the Radisic Family hired a contractor to seal all the cracks between the concrete blocks as well as between the steel shell and the concrete blocks. This work was undertaken by RF to ensure that the winter storms did not “find their way” through these cracks and into the hay. This will reduce the amount of “spoilage” in the stored hay facility. The Quonset Hut is now full of hay, ready for a long fall and a cold winter. 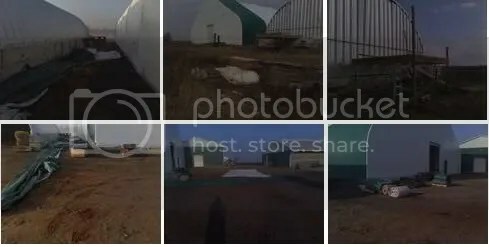 I hope that many of you had the opportunity to see the Radisic Family hard at work this fall in the cutting, bailing and storage of the hay in the Bank Barn and the Quonset Hut. There is residual waste material still at the back of the hut. That will be dealt with once the cold weather returns and the bees leave! There is no access to the wood piles as this time due to the bee problem at the farm. I do not have information on the status of the Shavings Shed upon arrival in November 2009, other than that it had a lot of residual “wet sawdust” that had not been cleaned by the previous tenants. There were no doors on the shed at that time, so the shavings (or sawdust in that era) were exposed to the elements. 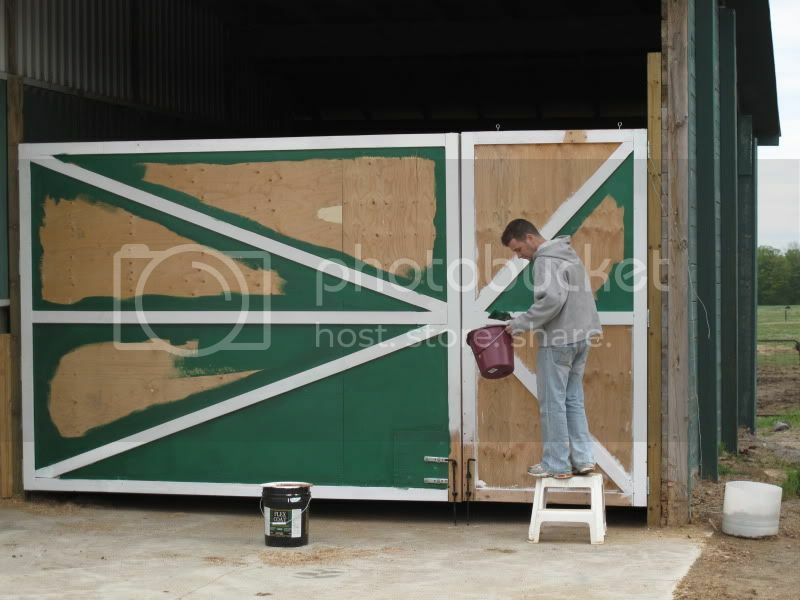 Mike built two large doors for the shavings shed which provided some protection but stormwater continues to be a problem as the area is not diked, nor is it drained. Significant rain events result in stormwater flowing down the driveway from the north, across the concrete pad and directly into the shed. the flooding from the concrete pad was alleviated in July 2010 as it was discovered that the drain below the shed that directs stormwater to the 24 hour field was plugged, now it is clear. Keeping the shavings shed in “the best condition” is a task of repeated chores. When it is likely to rain, the drainage ditches to the shed have to be cleaned, failing which the water goes directly into the shed. A rubber hose is laid across the entrance to divert high rainfall episodes, a process which eventually needs to be replaced by a permanent dike or drain. 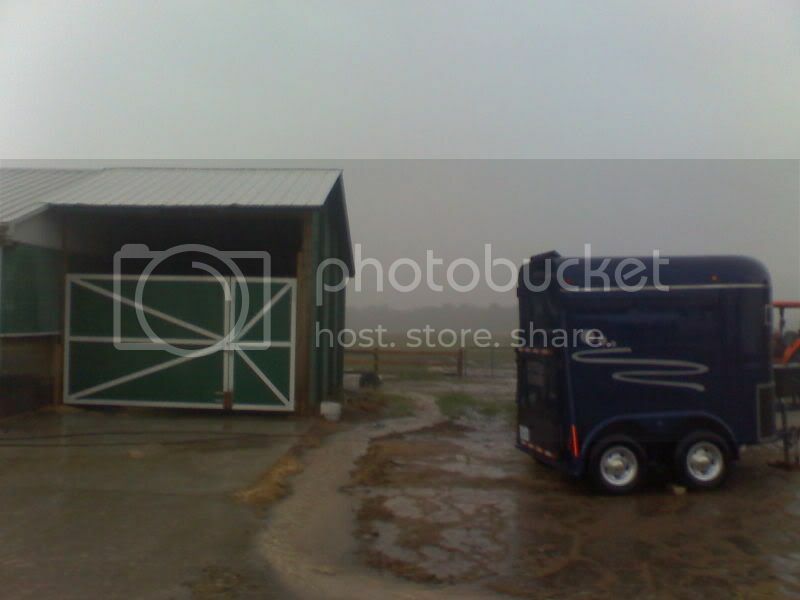 Whenever it does rain and the shavings get wet, they have to be hauled out and dried on the concrete pad. Stormwater Diverted Around the Shavings Shed - sometimes! The long-term solution to the shavings shed issue is to relocate or remodel the facility. 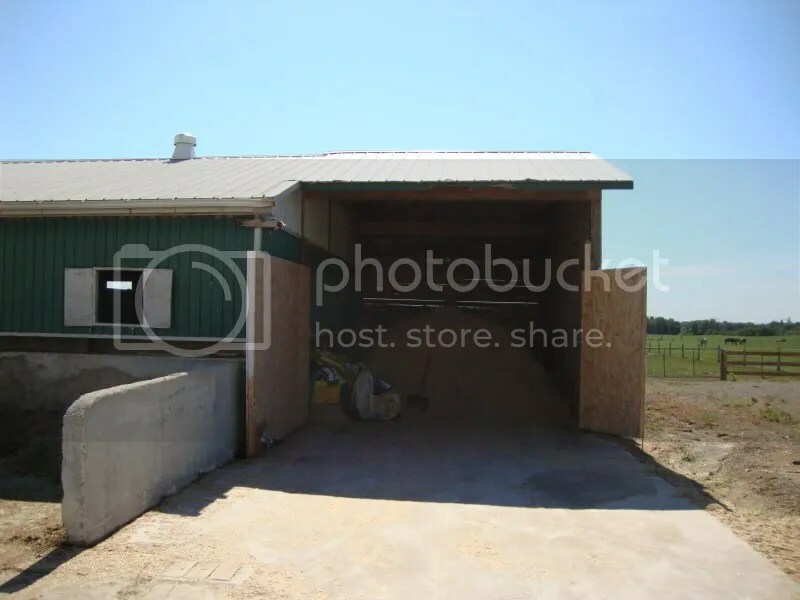 Moving it to an area that is not directly connected to a barn would be the preferred alternative for safety reasons. Raising the floor or installing a drain/trap would be the secondary alternative. In reality, the shavings need to be in separate areas accessible to all the barns, similar to the manure management areas. The ring did not exist in 2009. The area was previously part of the grassed area for the old farm house and part of a hay field. 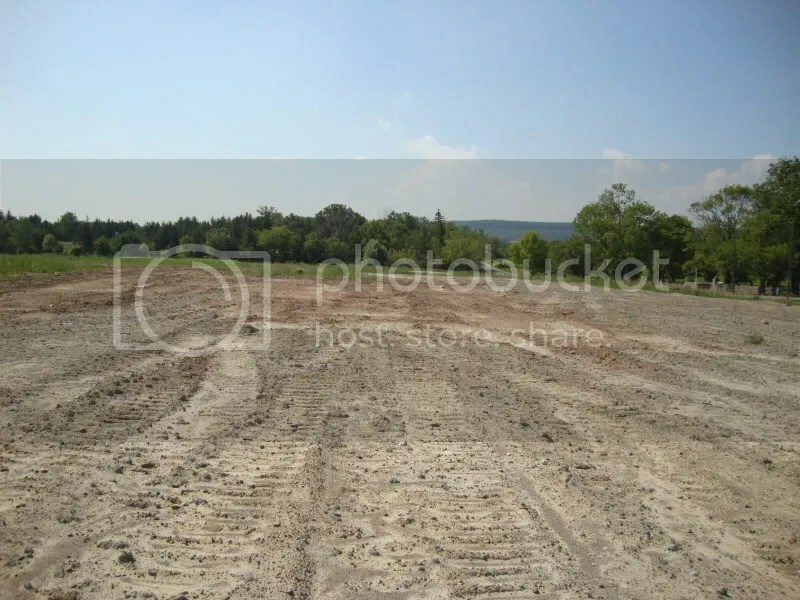 As part of the filling of the Radisic lands on the far west of the property, arrangements were made to place base material for the future construction of a new outdoor sand ring. This is located in the northwest area of the property, west of the Radisic home along the south side of 2nd Sideroad. All that has been placed today is sub-surface material that could be used to grade and level the area in preparation for the proposed new sand ring. The area would need to be levelled and drained before any additional work could be undertaken. Work on this sand ring came to a stand-still when the Radisic family was directed to end in-filling operations on the west side of the property. Apparently there were complaints about the number of trucks entering the property on a regular basis. There is no work underway at this time. LTS will check with RF to obtain a status report. A new large, level, well-drained multiple-use sand ring. Those with more information on the project can post their comments here. If you have general questions or comments, or postings that cover multiple topics, please feel free to post them here. This has been set up so that a new page would appear for each month, otherwise it may become too cluttered. If you have already posted a question or comment that fits this category, I would “cut & paste” that into a new comment in reply to this posting. If you can, the best place to put your comment is in the specific topic area so that others that are checking that topic will be sure to see your post. If that does not work for you, go ahead and post it here. We can take the question and answer and add that to the specific topic areas during subsequent updates.